The Atlantic 85 DO-DO is a fantastic road legal trailer which cost £60,000. The trailer is designed so that the boat enters the water bow first with the engines already running. This is achieved by having fresh water tanks mounted on each side of the trailer (one for each engine) which are connected to the engines via a pipe that will slide off the engine as the boat accelerates away. Folding support arms for net recovery, they also house lamps for night time use. Adjustable entry gates with LED strip lights running vertically for the helm at night. 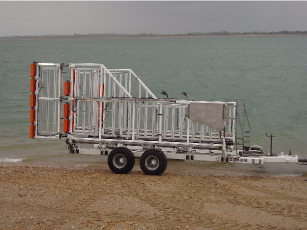 The D-Class trailer is also designed so the bow will hit the water first, but unlike the Atlantic 85 trailer, the D-Class trailer does not have a supply water to the engine. This means when the boat goes into the water the engine needs starting and warming up a little before accelerating off. High sides, this helps the helm for low water recovery for spring tides as the water is so shallow the trailer goes down into the channel. Optional winch, in some areas the tractor used for the D-Class isn’t designed to enter the water, so they get it as close as possible and winch the boat on with the help of the rollers. Rollers, having the rollers on the trailer reduce the depth of water needed to launch and recover the boat.